Oat Benefits - Oats or Groats, What's The Difference? →Oats, Groats, What’s The Difference? Oats, Groats, What’s The Difference? As you may remember, oats are one of the Super Heroes of Health Foods. They contain vitamin E, several B-vitamins, calcium, magnesium and potassium. Oats also have some of the trace minerals selenium, copper, zinc, iron and manganese. They’re full of good-for-you phytochemicals and have both soluble and insoluble fiber. Oats have been found to benefit heart health, lower blood pressure, and can even help prevent diabetes as part as a high whole-grain diet. Oats were one of the earliest cultivated cereals. The ancient Greeks were the first people known to make porridge (cereal) from oats. In England, oats were considered inferior, but in Ireland and Scotland they were used in many kinds of porridges and baked goods. Oats came to America with British immigrants in the 1600s, and in fact, the British Quaker influence inspired the name for “Quaker Oats.” Today oats are produced in many countries, but Minnesota, Wisconsin, South Dakota and central Canada lead in oat production in North America. So I Repeat, Oats, Groats, What’s The Difference? Oats come in more than one form. In fact, there are six basic types found at the grocery or health food store. Each kind has a different texture when prepared, different cooking times, and even some nutritional differences. Oat Groats (say that fast a few times!) are the starting point. This is the harvested “as-is” product. Whole oat groats are widely used as animal feed, but not so easily found for human consumption. Some health food stores carry them and you can find them on-line. Whole oat groats can be cooked or steamed, but because they’re a bigger grain than rice or even whole wheat kernels, take much longer to cook. It can take up to an hour, although a pressure cooker will shorten the cooking time. Because they are “as-is”, they have the highest nutritional value of all forms of oats. They are digested very slowly, which reduces the glycemic load and makes them quite filling. Just to make things even more confusing, steel cut oats are also commonly called Irish Oatmeal. They’re exactly what the name says, being whole oat groats that have been steel cut into smaller pieces. This shortens the cooking time, but keeps all the nutritional value of the whole oat groats. These are much easier to find at the grocery stores than whole oat groats. Look for either steel cut oats or Irish Oatmeal. Or you can buy them online as well. Scottish oats are not to be confused with Irish Oatmeal. They are steamed, steel cut oats than are then ground into a meal. This improves the grain’s ability to absorb water and allows a shorter cooking time. Some manufacturers toast the oats to create a richer-flavored oatmeal, or combine it with some oat bran to make the oat meal creamier. This type of oats makes a very creamy cereal that is quick to cook (usually around 5 minutes). A lot of people talk about first trying this cereal in Scotland, and being happy to find vendors at home so they can continue to have this porridge for breakfast! Thick Rolled Oats: These are made from steamed whole oat groats rolled into flakes. Because they’re the thickest variety, it takes them longest to cook. “Old Fashioned Oats”, or Regular Rolled Oats: Think Quaker Oatmeal. These are the steamed whole oat groats rolled into a thinner flake which shortens the cooking time. The texture is a bit mushier than thick rolled oats, but still pretty filling and full of whole grain goodness. Quick Oats: Instead of using whole oat groats, these are made from steel cut oats so are smaller pieces, and faster cooking. They digest a little quicker than regular rolled oats, but are still nutritious. Instant Oats: These are quick oats that have one more processing step… they are pre-cooked. Because of this, all you have to do is add hot water and they’re ready to eat. Non-flavored varieties may have a bit of salt added, but are still nutritionally decent. However, the flavored varieties can have a lot of sugar and artificial flavoring, so aren’t quite as good for you as regular types of oatmeal. One well known brand is Quaker Oats. These types of oatmeal are easily found in your grocery store, but are also available online for an easy shopping experience. There are two more types of oat products available, oat bran and oat flour. 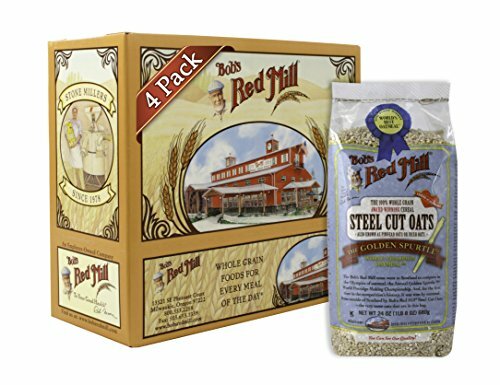 Made from oat groats ground into a fine oat meal, oat bran is then combined with some of the outer bran or husk of the oat to increase the overall fiber content of the oatmeal. Because of this, it is slightly higher in insoluble fiber than rolled or cut products. It is also quick cooking with a creamy consistency somewhat like cream of wheat. Oat bran is a great addition to breads or granola for a little extra fiber. Steel cut oats are steamed, then ground into a fine powder to make oat flour. It has a lot of fiber, but contains very little gluten. It can be used in place of wheat flour in recipes, though it is usually mixed with other whole grain flours since it needs a little help to make it rise due to the lack of gluten. Adding gluten powder to breads will help it rise better, or using baking soda or baking powder in your baked goods. No matter what variety of oats you choose, they’re a nutritional powerhouse that should be in everyone’s diet!